Been away for a week. Just got back late last night. Will update soon, with pictures of our wonderful vacation to Findley Lake, NY/Erie, PA. Does this count as a post toward my 100? And I guess at 8:09 pm, we could add "and three hours." Thank goodness for silly things like Lilypie Tickers to make these kinds of things known! Speaking of milestones, I'm pretty sure it was 12 years ago today that I met my sweet husband. "Who's that one with the long hair? He's cute." These were just some of the thoughts that went through my head that evening. We actually met playing elbow tag. (Highly fun, by the way, for those of you that work with youth.) He linked onto me. "Hi, I'm Duncan." "I'm Nancy." And that was it. Later on in that evening, we played a game that required everyone to lay down in a field, parallel to one another. The the first person began rolling over everyone and each subsequent person followed suit. I think it's called steamroller. He apologized to me numerous times after that game, telling me that he must have hurt me at the way I sounded as he went over me. I do remember it being an awfully uncomfortable game, in more ways than one, but I didn't remember any one person hurting me in any particular way. So that's how it began. We were at camp staff orientation, by the way, for those of you who don't know how we met and were wondering why a 19 year old girl and and a 21-year old boy were playing such games. It would be nearly two and a half years before we began dating and just over five years before me were married. I know he'll make fun of me for remembering this. But I can't help it. 100th, er I mean, 94th post!! Woohoo!! Recently, I've been building up to my 100th post, which, I thought, would be this one. As I went through my "archives," to get some inspiration for creating my 100th, I realized that I had several "drafts" of posts that were included in the 100. They were actually earlier versions of things that were eventually posted. Needless to say, when I deleted these bogus posts, it brought me down to 94. So, the pressure is off. I have six more posts to go until I need to make a big deal out of posting 100 times. Phew. Now I can go and scrub some toilets without a care in the world. ...even though it seems that Violet's tear duct procedure may have failed. Have any other parents wished so much that their kid "just" had pink eye? She woke up this morning with green crusty eyelashes, reminicent of the morning two weeks and two days ago--and the majority of mornings for the entirety of her life before that. Major bummer. That's what everyone keeps saying, including me. And it is. However, I've been trying to realign my perspective all day long. I've been telling myself all day that this is not a big deal. In the grand scheme of life, it really isn't. Tomorrow, I'll be calling the doctor to find out what we need to do next. Pray for wisdom and pray for healing. I believe God is capable of healing her without more surgery. But regardless of what happens in this situation, GOD IS STILL GOOD. That's my point. And I praise Him for that. Here, Violet worked very hard to get into her little seat. You can see she's quite pleased. 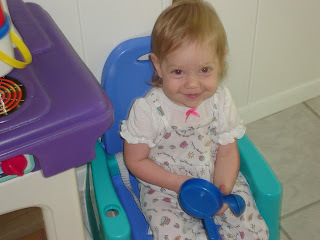 She can often be seen holding two objects from the play kitchen--a cup and a spoon, a bowl and a fork, or a pan and a ladle (as seen in this shot). She stirs and eats. It's so dang cute. 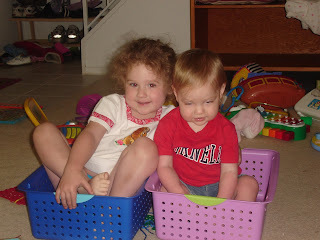 Amelie and Violet "cleaned out" these cute toy storage bins I purchased recently and then thought it would be fun to sit in them. Violet looks drunk, but I love it because it shows them doing something together, which is getting more and more frequent these days--much to Amelie's delight. This is the first day at the pool this season. 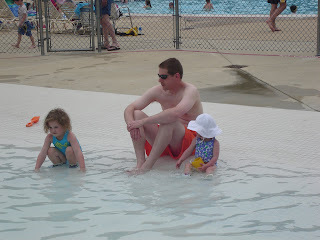 My adorable WHITE family loves the pool. We've already been six times since Memorial day! 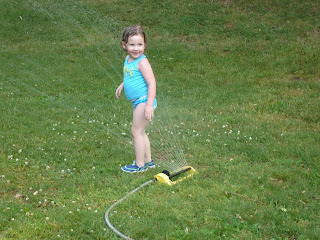 Duncan set up the sprinkler on a hot Sunday afternoon and Amelie and William had a blast. Violet, on the other hand, was quite offended at the water that snuck up on her as she played. These next two are just goofy shots that I think are fun. 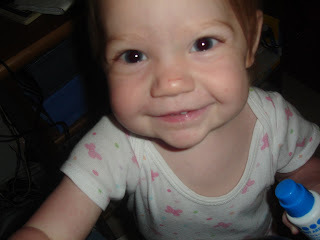 Amelie's extremely goofy face. 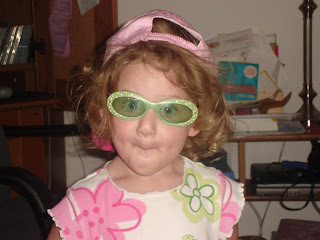 She LOVES her sunglasses. In other news, Duncan started his new job last weeks and it extremely satisfied. Even better, their moving from Annapolis to Bowie on Monday (a few weeks late, he was supposed to start there)--a twenty minute commute down to five. Rock the house! He'll MAYBE have to fill up his gas tank once every other week--how cool is that?